Last night was the climax of many things that have been happening in my second life. Like last year, it was an emotional event because my friends and I have confronted so many challenges as we made the Blues for Autism fundraiser come together. 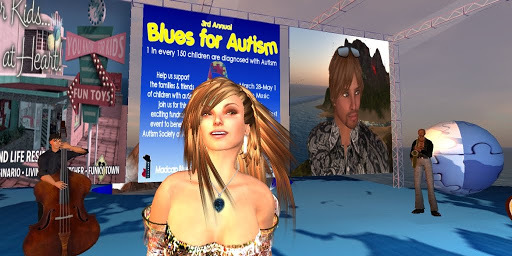 Please checkout the Blues for Autism blog for the overview of what went on this year, I think you’ll be amazed at how much can be done in this Second Life. Now, my human is heading away and that means I’ll be pulled away from this artificial world with her. Regardless of how much I enjoy roaming SL and being part of what’s going on here, that human on the other side of these pixels has a will of her own and in the end, she wins. Before I go, here is a pictorial essay of some recent people, places and things I haven’t had a chance to blog about yet. On Friday, Q took me to Ellie’s Spring Party on Moondance. Despite the hubbub of activity, Thor and I had a chance to get some face time in at Blues Fest. 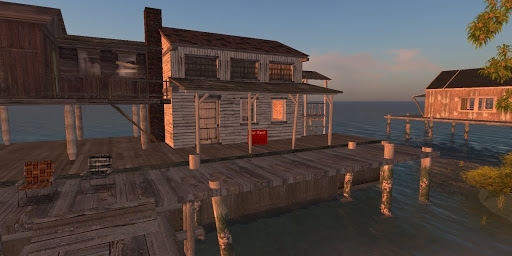 This is a little place on the pier over at Junkyard Blues. I’ve had my eye on it for something and I’m going to see if I can find a purpose for it (if it’s still available) when I get back. If you haven’t seen The Choo Choo Chicks yet, check them out. The Chicks are totally the hawtest, hugest girls band in all of Second Life!! Late last night I got some more good dancing in with Q. Hugzzz Q.
Lastly, this is for my best friend, LeLe. I know we’ve both been swept away with activities in the past few weeks, but we’ll have so much to talk about. When I get back, after we’ve talked for several days straight, I want to make my first blog post about your new island home. Hugzzz, girlfriend. Bye everyone, see you in a few weeks. This entry was posted in Journal and tagged Events, Friendships, Nightlife, Parties, Perspectives, Second Life, Socialite. Bookmark the permalink.